You are browsing the archive for tour. Lovecraft fans that are familiar with The Dunwich Horror will recall the various scenes in the Orne Library where Wilbur Whateley goes in to request the Necronomicon from the Special Collections area. The story goes into detail regarding the hoops one must go through to access any of the arcane books from the collection. Lovecraft based these procedures on actual libraries that limit the access to certain documents based on membership (e.g. students of a particular ivy-league college) or conditions (e.g. certain times of the day). 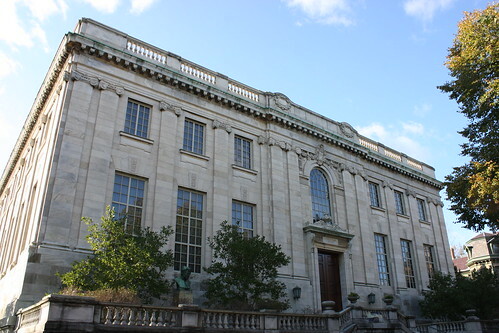 Visiting the John Hayes Library across the street from Brown University provides that experience to any/all Lovecraft fans. Inside the John Hayes Library within their Special Collections area you can find the largest collection of Lovecraft manuscripts and letters. You walk up to the Librarian and request to see the listing and they’ll pass to you a 300+ page volume containing a listing of all the letters, postcards, manuscripts (handwritten & typed) and any other type of document that Lovecraft left behind. The archives hold boxes of all these documents and inside are photocopies of the originals. Some of these photocopies go back to the 1940s! You have to register with them, fill out various forms, leave your ID and specify which boxes, yes BOXES, you would like to see. They walk you over to the Special Collections viewing area which is guarded by staff members and cameras watching everything that you do. I walked in and requested boxes 12 and 20 and had a chance to sit in the Special Collections area and wait in anticipation as they delivered the boxes from “down below in the basement.” Myself and Tabatha, the Vice-Chancellor, sat in the silence as the Brown student walked in with the 2 oblong boxes and placed them before us. 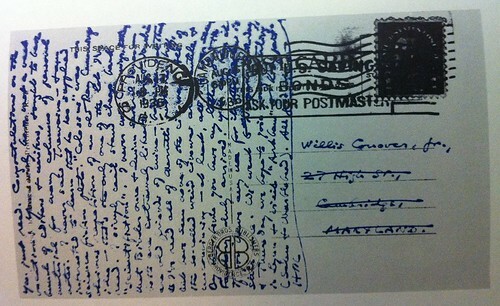 Box 12 had postcards and correspondence between Lovecraft and Derleth along with others. It was interesting to see all these postcards that Lovecraft hand-wrote with his cursive script and chronicling his journey from Rhode Island to St. Petersburg, Florida. Page by page we flipped through and read his stories and observations. He even had one letter where he explained the differences in the pronunciations of the locals regarding state names. If you are into this type of research, there is a book called Lovecraft at Last that I suggest reading. It was limited to 1000 copies and several libraries have a copy available. These tome has photos of some of these manuscripts and transcribes some of the letters that are more difficult to read. It even goes into explaining why Lovecraft regarded himself as Ec’h-Pi-El in his letters. Box 20 was like the Holy Grail as it had in neatly presented folders the typed 1st print reproductions of the manuscripts for stories such as: The Dunwich Horror, Ex Oblivione, The Doom that Came to Sarnath, Herbert West – Reanimator and others. It was fascinating to see the typed pages and have the old photocopy toner collect on my fingertips. With each flip of the page, it was a wonder to see the edits in place as particular words were XXXXXXX-ed out on his typewriter. When travelling throughout New England on this journey through time, the John Hayes library should be a pivotal stop to immerse oneself into the world of Lovecraft. Sitting in that chamber review these works brings one into the mindset of Dr. Armitage and poor souls of Lovecraft’s work. 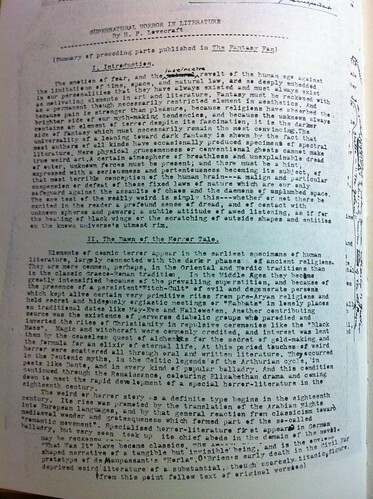 Unfortunately the Hayes library forbids the use of cameras and so no photos of these manuscripts area available other than scans I made from Lovecraft at Last as a demonstration of what was available.